I have been reading every source I could find on Big Data recently. The ideas behind BD are appealing: develop algorithms based on the things people actually do, then use those algorithms to either exploit marginalities (in the case of Wall Street traders or Moneyball-style sports organizations) or to reduce them (in the case of crime-fighting, and in the dreams of school reformers who want to close the yawning chasm between learners at the top and those at the bottom). In a world where algorithms seem to rule, we could make a place for education, couldn't we? Max Ventilla sure has. The founder of a charter-school start-up called AltSchool, Ventilla was profiled recently by Education Week, describing his new school in San Francisco where students' use of Chromebooks is tracked keystroke by keystroke. Their actions within the classroom are recorded on camera to identify the best use of space. Their accounts with NewsELA are tracked as is every aspect of their learning and learning environment. He sees all those torrents of data flowing from the classroom into the cloud, where...software and algorithms created by Silicon Valley's top developers and data scientists would then search the waters for patterns in each student's engagement level, moods, use of classroom resources, social habits, language and vocabulary use, attention span, academic performance, and more. Consider this TED Talk from Sebastian Wernicke on how Amazon tried to use Big Data to find popular shows to develop for its streaming channel. Ever hear of "Alpha House"? It was a no-brainer, a Big Data winner about four conservative senators living together in DC. I'm the episode where they are confronted by a woman whose food stamps they have de-funded is a real side-splitter. There is also a really emotional scene where they all gather round and stare at an image of a fetus. Wernicke compares Amazon with Netflix, which seems to have found quite a few hit shows to stream--House of Cards, Master of None, Making of a Murderer, to name a few. They have used experts to select shows with assistance from algorithms. Even in the face of huge amounts of data, it still pays off to make decisions, to be an expert in what you're doing and take risks. Because in the end, it's not data, it's risks that will land you on the right end of the curve. I have been sitting at the feet of Big Data visionaries for a few years now. What they sell is a kind of "inside knowledge" that is appealing to know ahead of time. But what I see in public education is Big Testing that hasn't successfully made BD useful for either me or my students. The amount of data being collected on students and teachers is more onerous than ever before, but I haven't seen a bit more useful data in recent years than when I started teaching in 1994. Consider the ACT. This is BFD BD, with my high school juniors completing a 90-minute, exhaustive survey every year before the test that takes half as long as the test itself. Questions about family income, career interests, school grades--even religious affiliation--get penciled in by students during class time (usually English class). All that BD goes back to ACT where it is...sold to colleges. Every student gets an ACT score, and every school in Tennessee gets an overall ACT average. That's it as far as data goes. ACT could tell me how my individual students did. It could tell my school which skills are good and which skills are lacking. It could tell my department chair which teachers are effective. Instead we get a number, our principal compares that number with nearby schools, and he feels proud or frustrated based on our relative performance. Hows that for Big Data in the real world? Year before last, Big Data spit out a number to measure my effectiveness as a teacher. It was pretty good. It was based on a test of my students' literacy skills (the writing tests were never graded in time, and Big Data didn't care about the clubs I sponsored or the professional development I sought for myself). I felt pretty good. I don't know why I felt good, looking back, but that was a pretty high number on the 1-5 scale. Last year Big Data gave me a different, much lower number. One year after a high number, I dropped three points. It was all right there--or at least it should have been. My principal broke down the data and gave me a printout comparing my students' scores with those that the almighty algorithm had predicted. He highlighted the students whose scores were either ten points above expectation or ten points below. There was a mix. But there were more that were lower than higher. One of the ten-point-lower scores surprised me. She was one student who had told me her ACT score in English. She had earned a 30. She had taken my standard class. What did I do wrong? What could I improve this year? Big Data could help with that, couldn't it? It couldn't. I went back and changed my lessons to stuff in even more tested standards. I'd love to write that I expect a three-point jump this year, but I honestly have no idea. Max Ventilla has a cool job. I'd love to work for a guy like him, implementing new technologies in the classroom or throwing around Big Ideas about Big Data. Instead, I teach in a school. I wake up every morning thinking about specific lessons I plan to deliver. On the rare occasion when every paper is graded, I get to raise my eyes to the horizon and read about what guys like him are doing. Big Data offers lots of promise, and I don't write to deny its efficacy, just to wonder when BD will deliver on its promise to deliver to teachers and students in America's public schools. The challenge can best be understood by a reference to the Bible. The early Christian church began with a core group of big thinkers--the biggest of which was Jesus Christ, and his group of followers grew in the weeks following his crucifixion into apostles, that is to mean, messengers of the big ideas that Jesus had pioneered. There was a problem for these apostles, though. They needed to broaden their base--to get their big ideas into the daily lives of people around the world. They were the first wave, and while they would speak and write and remember their big ideas for the rest of their lives, they needed a boost. So they created the role of "deacon." So the Twelve gathered all the disciples together and said, “It would not be right for us to neglect the ministry of the word of God in order to wait on tables. Brothers and sisters, choose seven men from among you who are known to be full of the Spirit and wisdom. We will turn this responsibility over to them and will give our attention to prayer and the ministry of the word. From the context of the first verse, it appears that these new appointees would "wait on tables." Initially their role was somewhat similar but far more important. They engaged with the common people. They set up community meals at homes throughout Judaea and Syria which would grow into the dioceses and churches of the Christian faith. They put the "butts in the seats" so to speak, whose minds would be changed by the big ideas. The big ideas would have gone nowhere without the deacons to arrange meals, set up chairs, invite guests. 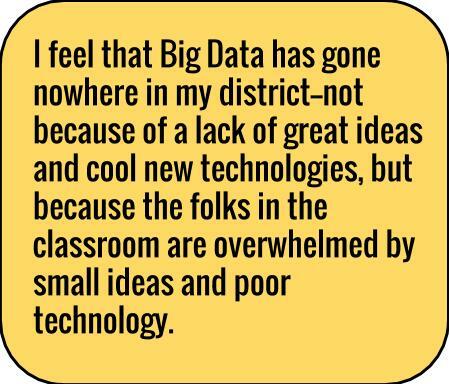 In the same way, I feel that Big Data has gone nowhere in my district--not because of a lack of great ideas and cool new technologies, but because the folks in the classroom are overwhelmed with smaller ideas and poor technology. Can we get someone from the TED stage to enter the classroom and work there for a meaningful time? It was the deacons' work on the ground that spread the Big Idea--that connected it with core communities and recruited more people to "wait on tables" and spread the apostles' words. In my most frustrated moments as a teacher--and in a few of my most enlightened--my eyes turn away from the Data Apostles like Max Ventilla and Sebastian Wernicke and look for the Data Deacons. I want to see big data work for me NOW. I've been reading about the future for too long. Perhaps it's time to look away from the literature and the TED Talks and look for the people in my district or my state who have put big data into a place where it can work for me.